Usher Terry Raymond IV (born October 14, 1978), who performs under the mononym Usher, is an American singer, songwriter, dancer, and actor. Usher rose to fame in the late 1990s with the release of his second album My Way, which spawned his first Billboard Hot 100 number-one hit, "Nice & Slow". The album has been certified 6-times platinum by the RIAA. His follow-up album, 8701, produced the Billboard Hot 100 number one hits "U Remind Me" and "U Got It Bad". The album has been certified 4-times platinum by the RIAA. Usher's 2004 album Confessions sold over 10 million copies in the United States, and been certified diamond by the RIAA. Confessions has the highest first week sales for an R&B artist in history. It spawned four consecutive Billboard number-one hits—"Yeah! ", "Burn", "Confessions Part II", and "My Boo". Usher's 2008 album Here I Stand sold over 5 million copies worldwide, and its lead single "Love In This Club" peaked at number-one on the Billboard Hot 100. On March 30, 2010, Usher released his sixth studio album Raymond v. Raymond, which became his third consecutive album to debut at number one on the US Billboard 200 chart. It has been certified platinum by the RIAA, and spawned another Billboard Hot 100 number-one hit "OMG". The song became his ninth number one in the United States, making him the first 2010s artist to collect number one singles in three consecutive decades. He later released an extended play and deluxe edition of "Raymond v. Raymond", entitled Versus, which debuted at number four on the Billboard 200 chart. Its lead single "DJ Got Us Fallin' In Love" reached number four on the Billboard Hot 100. The RIAA ranks Usher as one of the best-selling artists in American music history, having sold over 23 million copies in the United States alone. To date, he has sold over 65 million records worldwide, making him one of the Best selling music artists of all time. Usher, has won numerous awards including seven Grammy Awards. At the end of 2009, Usher was named the number one Hot 100 artist of the 2000s decade. Billboard named him the second most successful artist of the 2000s decade, with his 2004 album Confessions being ranked as the top solo album of the 2000s decade. Billboard also placed Usher at number six on their list of Top 50 R&B/Hip-Hop Artists of the Past 25 Years. Usher has attained nine Hot 100 number-one hits (all as a lead artist) and has attained eighteen Hot 100 top-ten hits. At age 11, Usher joined an R&B local quintet called the NuBeginnings, which was organized by local music svengali, Darryl Wheeler. Usher recorded 10 songs with the group in 1991, and the ensuing album, Nubeginning Featuring Usher Raymond IV, was only made available regionally and by mail order. However, Patton took him out because, according to her, it was a "bad experience". The album was re-released nationally in April 2002 by Hip-O Records. At age 13, Usher competed on Star Search, where he was spotted by an A&R representative from LaFace Records, who arranged an audition for Usher with L.A. Reid, the co-founder of LaFace; Reid signed Usher to a contract with the record company. Usher's mother left her job as a medical technician to manage his career, but later broke-up their relationship as manager-client in May 2007. Usher was introduced on "Call Me a Mack", a song he recorded for the soundtrack album to the 1993 drama-romance film Poetic Justice. On August 30, 1994, LaFace released Usher's self-titled debut album. Sean "P Diddy" Combs produced several of the tracks and co-executive produced the album. Usher peaked at number twenty-five on the Billboard Top R&B/Hip-Hop Albums chart and was accompanied by three singles: "Can U Get Wit It", "Think Of You", and "The Many Ways". The album has sold over 500,000 copies, to date. After graduating from high school, Usher continued to develop his skills as a stage performer and laid the groundwork for his second album. He also appeared on their version of "Let's Straighten It Out", a 1995 duet with fellow Atlanta teen recording artist Monica; and on "Dreamin'", from LaFace's 1996 Olympic Games benefit album Rhythm of the Games. He was also featured on "I Swear I'm In Love" off the 1996 Kazaam soundtrack. Usher developed a friendship with American record producer, Jermaine Dupri, with whom he co-wrote and produced several tracks for his second album, My Way, released on September 16, 1997. The album's lead single, "You Make Me Wanna", reached number one in the United Kingdom, becoming Usher's first record to be top single; the record led to his popularity reaching in the country. It also became Usher's first gold- and platinum-certified single in the United States. The album's second single, "Nice & Slow", peaked in January 1998 at number one on the Billboard Hot 100, giving Usher his first US number-one single. Later in February of the same year, the single was certified platinum by the Recording Industry Association of America; My Way has been certified six-time platinum in the United States. "You Make Me Wanna" won the Best Male R&B/Soul Single at the 1999 Soul Train Music Awards. In the closing months of 1997, Usher embarked on a series of tour engagements including a spot on Puffy's No Way Out tour, dates with Mary J. Blige, and the opening spot on Janet Jackson's The Velvet Rope Tour. Usher's first concert album, Live, was released in 1999, which featured appearances by Lil' Kim, Jagged Edge, Trey Lorenz, Shanice, Twista and Manuel Seal; the album has been certified gold in the United States. Usher made his acting debut on the UPN television series Moesha, which resulted in a recurring role on the series and subsequently his first film role in 1998's The Faculty. Usher's extracurricular activities outside of the recording industry gathered momentum over the following year as he was cast in the soap opera, The Bold and the Beautiful. He completed two more films, She's All That, and his first starring role in Light It Up. He also appeared in the Disney TV movie "Geppetto". Usher's third studio album, originally titled All About U, was slated to be released in early 2001. The first single, "Pop Ya Collar", was released in late 2000 and became a number two hit in the UK but underperformed in the United States. The album was subsequently pushed back and retooled after select tracks were later leaked to the radio and Internet. After having revised and renamed to 8701, the album was released August 7, 2001 (8.7.01). The first two singles "U Remind Me" and "U Got It Bad" each topped the Billboard Hot 100 for four and six weeks, respectively. 8701 has been certified four-time platinum in the United States. Usher appeared in the 2001 film Texas Rangers. In February 2002, Usher won a Grammy for 'Best Male R&B Vocal Performance' for "U Remind Me". The next year, he won the same award for "U Don't Have to Call", making Usher the only artist aside from Luther Vandross and Stevie Wonder to win this award consecutively. In summer 2002, Usher contributed vocals to P. Diddy's "I Need a Girl, Part I". The year closed out with a trio of TV series appearances, all in November, on The Twilight Zone, 7th Heaven, Moesha, and American Dreams, the latter in which Usher portrayed Marvin Gaye. Usher's fourth studio album, Confessions, was released on March 23, 2004—just as its first single, "Yeah! ", was in its sixth week at number one on the Billboard Hot 100 and fifth week on top of the Hot R&B/Hip-Hop Singles Chart. The album's nearly 1.1 million unit debut sales was the highest first-week numbers ever scanned by a male R&B artist and the seventh best of the Nielsen SoundScan history. To date, the album has accumulated sales of over 20 million copies worldwide, over 10 million of which were sold in the United States, earning the album a Diamond certification by the Recording Industry Association of America. The album's second and third singles, "Burn" and "Confessions Part II", also topped the Billboard Hot 100, the former for eight weeks. Usher became the first artist to top the Billboard Hot 100 Airplay with four consecutive number-one singles, In September 2004, "My Boo", a duet with American singer-songwriter Alicia Keys, also peaked at number one at the Billboard Hot 100, becoming the album's fourth number-one single. In December, the album's final single "Caught Up" peaked at number eight on the Hot 100. Confessions earned Usher numerous awards, including four American Music Awards, two MTV Europe Music Awards, two MTV Video Music Awards, and three World Music Awards. At the 47th annual Grammy Awards ceremony in 2005, Usher won three awards, including: R&B Performance by a Duo or Group With Vocals for "My Boo", which he shared with Keys; Rap/Sung Collaboration for "Yeah! "; and Contemporary R&B Album for Confessions. At the 2004 Billboard Music Awards, Usher was recognized Artist of the Year, in addition to receiving 10 other accolades. In spring of 2005, Usher scored a number three Hot 100 hit as a featured vocalist on Lil' Jon's "Lovers & Friends". In 2007, Usher also collaborated with R. Kelly on the track "Same Girl", for Kelly's album, Double Up. He was also featured in a remix version of Omarion's "Ice Box". Usher also appeared on the track "Shake Down" on American singer-songwriter Mary J. Blige's 2007 album Growing Pains. In November 2005, Usher starred as a disc jockey named Darrell in the Lions Gate film, In the Mix. On August 22, 2006, Usher took over the role of Billy Flynn in the long-running Broadway musical Chicago. Here I Stand was released on May 26 in the United Kingdom and May 27, 2008 in the United States. The album debuted at No.1 on the Billboard 200 Chart with first-week sales of over 433,000 copies. It has been certified platinum by the RIAA. To date Here I Stand has now sold over 1.5 million copies in the United States, been certified platinum by the RIAA, and has sold over 5 million copies worldwide. But from the success it was a bad commercial success and received positive reviews from most music critics. Who praised the maturity in the album's lyrics. To promote Usher's fifth studio album, the single "Love In This Club" was sent to radio in February 2008 and peaked at number one on the Billboard Hot 100. It went on to spend three consecutive weeks at the top—becoming Usher's eighth number-one single and the fastest-rising song of his career. It also reached No.1 on the Hot R&B/Hip-Hop Songs chart. The single was another huge international success for Usher. It reached No.1 on the New Zealand Singles Chart, No.3 on the Irish Singles Chart, No.3 on the Eurochart Hot 100, No.4 on the UK Singles Chart, No.5 on the Japan Hot 100, No.5 on the German Singles Chart, No.5 on the Belgian Singles Chart (Flanders), No.6 on the Canadian Hot 100, No.8 on the Swedish Singles Chart, No.8 on the Australian Singles Chart, No.9 on the French Singles Chart, No.9 on the Swiss Singles Chart, No.10 on the Norwegian Singles Chart, No.12 on the Austrian Singles Chart, No.13 on the Belgian Singles Chart (Wallonia), and No.18 on the Finnish Singles Chart. The follow-up single "Love in This Club, Part II", which features American singer Beyoncé Knowles and rapper, Lil Wayne, peaked at No.18 on the Billboard Hot 100 and No.7 on the Hot R&B/Hip-Hop Songs chart. Its third single "Moving Mountains" peaked at No.18 on the Hot R&B/Hip-Hop Songs chart and reached No.6 on the New Zealand Singles Chart. The album's fourth single Trading Places" peaked at No.4 on the Hot R&B/Hip-Hop Songs chart. In September 2008, Usher announced he would embark on the 15-date tour One Night Stand, in which the audience is only females. On January 18, 2009, Usher performed with Stevie Wonder and Shakira at the We Are One: The Obama Inaugural Celebration at the Lincoln Memorial. He also sang "Gone Too Soon" at the memorial of Michael Jackson on July 7, 2009. Raymond v. Raymond, was released on March 26, 2010 in Germany, on March 30, 2010 in the US, and was released April 26, 2010 in the UK. The album was expected to follow in Usher's Confessions album's footsteps. Raymond v. Raymond was released only months after Usher's divorce from Tameka Foster. "Papers" was released as the first single for the album in October 2009 on iTunes. It topped the Hot R&B/Hip-Hop Songs chart for two consecutive weeks, becoming his tenth number one single on that chart. It also peaked at number 31 on the Billboard Hot 100 in the United States. The song itself appears to be loosely based on his failed relationship with his ex wife Tameka. Critics praised the song for its emotion. "Hey Daddy (Daddy's Home)", was released as the second single on December 8, 2009. The single peaked at number 24 on the Billboard Hot 100 chart and number 2 on the Hot R&B/Hip-Hop Songs chart. The song was released as the second international single in July 2010. "Lil Freak" was announced as the album's official second single in the United States. Usher and Nicki Minaj shot the music video for the song on March 9, 2010 in Los Angeles with director TAJ. It reached number 8 on the Hot R&B/Hip-Hop Songs chart and number 40 on the Billboard Hot 100. It became Usher's fourth Top 40 hit single from Raymond v. Raymond, when including the buzz single "Papers". "OMG", which features will.i.am, is the third official US single and the first international single. The song received mixed reviews, complimenting the song's dance and club vibe but criticizing the Auto-Tune effect. It reached number-one in Ireland, New Zealand, the United Kingdom, Australia and the United States. The song became his ninth number one in the United States, making him the first 2010s artist to collect number one singles in three consecutive decades, and only the fourth artist of all-time to achieve the feat. Usher also became the third artist to have at least one number one song from five consecutive studio albums. The song's choreography and dance-heavy accompanying music video has been compared to that of "Yeah!". *"There Goes My Baby" was released to airplay as the album's fourth single in the United States on June 15, 2010. The song reached number 25 on the Billboard Hot 100, and number-one on the Hot R&B/Hip-Hop Songs chart, becoming Usher's eleventh number-one hit on that chart. All of the album's singles received incredible air play. On April 7, 2010 Raymond v. Raymond debuted at number No.1 on the on the US Billboard 200 chart, becoming his third consecutive No.1 album and selling an impressive 329,107 copies in its first week of release, making him the first male artist since Eminem to have three consecutive albums debut at number one on the Billboard 200 chart. After one month of release the album was certified Gold by the RIAA. On June 17, 2010 the album was certified Platinum by the RIAA. Raymond v. Raymond also dominated the International Charts. Debuting inside the top 10 in Canada, the United Kingdom, Holland, Australia, Germany, Spain, and Italy. Due to the huge international success of Ushers newest single "OMG" and the good first week sales for Raymond v. Raymond Usher is considered to have repaired his mainstream image and to have made a good comeback. The album reached number-two in Australia and the album has been certified gold by the Australian Record Industry Association (ARIA). The album debuted at number four in Canada and has been certified Gold by the Canadian Recording Industry Association (CRIA). Raymond v. Raymond debuted at number-two in the United Kingdom. Usher announced on July 8, 2010, a follow-up extended play to his sixth studio album Raymond v. Raymond called Versus, and a deluxe edition of Raymond v. Raymond, both to be released on August 24, 2010. Usher described Versus as "the last chapter of Raymond v. Raymond", and that it would explore the subjects of being newly single and a father. 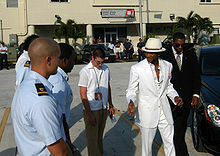 The album included 9 tracks, including 7 new tracks, Raymond v. Raymond single "There Goes My Baby", and Justin Bieber single "Somebody to Love (Remix)". The tracks would be included on a deluxe edition of Raymond v. Raymond. The album debuted at number four on the Billboard 200 chart and is preceded by the singles "DJ Got Us Fallin' In Love" featuring Pitbull, for mainstream audiences, and "Hot Tottie" featuring Jay-Z, for urban circuits. The first single from the album, "DJ Got Us Fallin' In Love", was released to iTunes on July 13, 2010 and sent to radio on July 20, 2010. Due to strong digital sales the song debuted at number nineteen on the Billboard Hot 100. The song became the fourth highest debut on the Billboard Hot 100 of his career, behind 1997's "Nice & Slow" at number nine, 1998's "My Way" at eight, and 2010's "OMG" at number fourteen. Since its release, it has gained international success, peaking in the top 5 in the United States, Australia, and New Zealand. It reached the top 10 in Canada, and Europe. It reached number-nine on the Billboard Hot 100 in its third week of release, and became the first time Usher has had two top-ten hits on the Billboard Hot 100 at the same time since his album Confessions. It also became Ushers sixteenth Billboard Hot 100 top-ten hit of his career. The second single, Hot Tottie has reached number thirteen on the Hot R&B/Hip-Hop Songs chart and number twenty-five on the Billboard Hot 100. Usher appeared at the 2010 MTV VMAs on September 12, 2010. He then performed at the 2010 American Music Awards on November 21, 2010 and also won the awards for Male Soul/R&B artist and Favorite Soul/R&B album for his album, Raymond v. Raymond. According to Rap-Up.com, Usher has started working on his next studio album, and that he is again teaming up with long-time collaborator Rico Love. During an interview with stylelist, Usher explained that he is working on a new genre of music depicted as 'revolutionary pop', to which several different genres are combined to create a new sound, this new music is to be included on his upcoming album. The OMG Tour began in November 2010. Usher also made a surprise appearance at Super Bowl XLV to sing his song, "OMG" with The Black Eyed Peas' musician will.i.am. He appeared on a rope from above, in a similar style to the Black Eyed Peas. The OMG Tour ended on June 1, 2011, it made $70 million worldwide. Usher seventh studio album, entitled Looking 4 Myself, was released on June 12, 2012. He teamed up with long-time collaborator Rico Love. During an interview, Usher explained that he is working on a new genre of music depicted as 'revolutionary pop', to which several different genres are combined to create a new sound. The lead single from Usher's seventh studio album is titled "Climax". It impacted Urban radio on February 21, 2012 and was made available for purchase as a digital download on February 22, 2012. It impacted US mainstream radio on March 13, 2012. The second single released from the album was "Scream" and the third single "Lemme See" which features Rick Ross. "Scream" was premiered on April 26, 2012, while "Lemme See" was premiered on May 8, 2012.